Late one mid-September Sunday afternoon, in a store at 900 South and 300 East in Salt Lake City, a group of women is gathered in prayer. Their devotion is focused on a large altar draped with fabric and garlands, where three skeletal statues stand surrounded by flowers, gently flickering vigil candles and offerings of food. Working their rosary beads between their fingers, the women, wearing dresses embroidered with colorful Aztec-style designs, chant Hail Marys and Our Fathers. The store is a botanica, a spiritual supply store that sells candles, herbs, amulets and statues. But this evening, Botanica San Antonio is home to a "spiritual mass," an event held monthly for the past seven years, says owner Alvina Tavera in Spanish, translated by her daughter Rakna. The women are praying rosaries for the Mexican folk saint Santa Muerte—aka La Huesuda (The Bony Lady), La Flaca (The Skinny Lady) and La Santisima Muerte (Most Holy Death). A grinning skeleton in a nun's robe, Santa Muerte is depicted with a variety of objects: a globe (symbolizing her universal presence), an hourglass (a reminder of life's inevitable end), an owl (representing that she sees and hears all), and a set of scales for justice. And she's almost never seen without a tall scythe that she clutches in one bony hand. She brings her scythe with her, Tavera says, "for everybody who seeks to betray others." Seen as vengeful by some, a kindly grandmother by others, Santa Muerte has many faces even among her believers: a saint for the end of days, a New Age deity, or a spiritual guardian for those who can find no place in mainstream Utah culture. But all of Santa Muerte's faces reflect the power of death. Her favors do not come without a price: You make a contract with her, and if you do not fulfill that contract, then, sometimes, she will seek recompense. 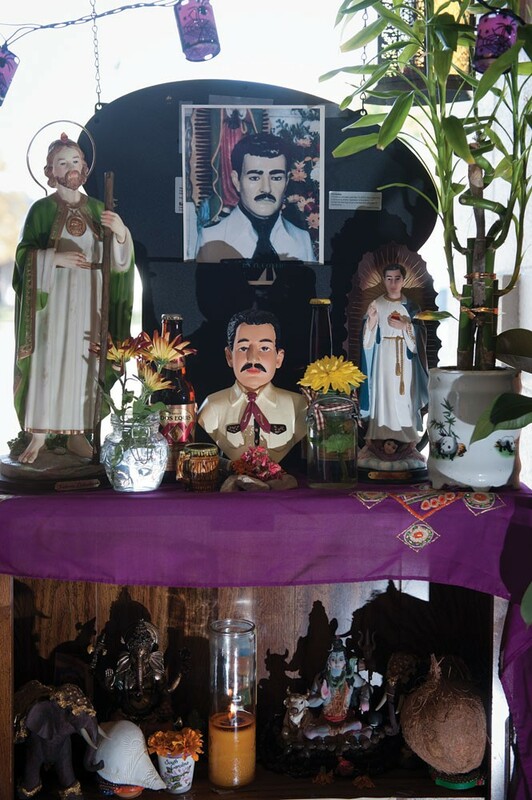 In the past decade, botanica owners say, Santa Muerte has gained a considerable presence in Utah among Latinos and Anglos, and statues and candles bearing her likeness now dominate most botanica shelves. And in contrast to the peaceful, spiritual ambiance in Botanica San Antonio, Santa Muerte is most typically known as a bloodstained symbol of death and power, a "narco saint" that drug dealers and the Mexican underworld use for justification for their activities and to intimidate their rivals. Law enforcement and critics in the Roman Catholic Church say that Santa Muerte's recent popularity has its roots in Mexican drug cartels' grip on the distribution of heroin in Salt Lake City. But many Latinos and Anglos on the margins of Utah society argue that what draws so many to Santa Muerte is that the deity welcomes all with open arms. The embrace of Most Holy Death, Tavera says, knows no prejudice. All are welcome to the blessings, protection and good fortune she can provide with the keen edge of her scythe and her scales of ultimate justice. All that matters, Tavera says, is that those who petition Santa Muerte do so with sincerity. "She likes that when you are devoted, you give your heart to her with faith." City Weekly Music Editor Kolbie Stonehocker first encountered La Santisima Muerte while getting inked at a Salt Lake City tattoo shop. The tall statue repeatedly drew her gaze with its quiet power. Kolbie asked the tattoo artist who the statue was, and he told her it was La Santisima Muerte, the female patron saint of drug dealers, criminals, tattoo artists—outsiders. His statement struck a chord with Kolbie. If there were patron saints for astronomers, firefighters, seamstresses and even cat lovers, why couldn't there be a saint who accepted all people, no matter their occupation, background or lifestyle? After the tattoo session, Kolbie wanted to show Santa Muerte a gesture of respect. Seeing coins placed at the statue's base, she dug into her purse to find a suitable offering. After stacking three coins by Santa Muerte's feet, Kolbie looked into her eyes and felt her staring back. 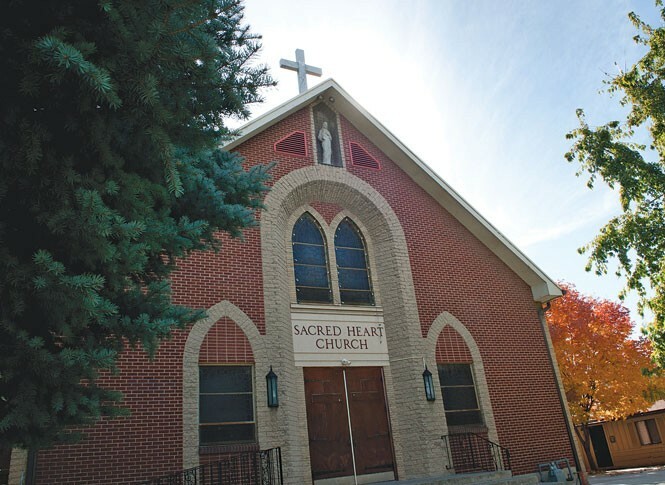 Seven years later, Kolbie—now a devotee of Santa Muerte—and City Weekly News Editor Stephen Dark set out to explore Santa Muerte's presence in Salt Lake City, talking to believers, botanica owners, cops who encounter her on altars in drug "stash houses" and in the tattoos of drug dealers they arrest, and Catholic priests who are concerned about parishioners petitioning her for help. But even though she's not a saint in the Catholic definition of the word—someone who had an earthly existence and led an exemplary Christian life—her followers believe that she possesses a power that places her second only to God. Santa Muerte is "muy cabrona, muy macha," Tavera says. "If you do everything right, if you are a believer, she'll protect you." 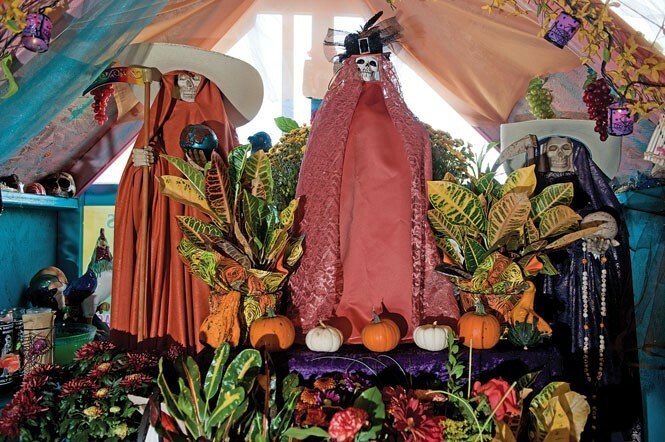 La Santisima Muerte and the practices surrounding her are "not something you can just talk about," Tavera's daughter Rakna tells us, as Tavera disappears into a back room to pray before the interview she's agreed to. While we wait, Rakna explains that it's a common misconception of Santa Muerte that if "you work with her, she'll take away one of your loved ones." But she says that if a devotee doesn't keep his or her promise to Santa Muerte, then everything that she's done for that person will unravel. "I've seen it happen a lot," Rakna says. Ten minutes later, we're ushered into a small room with a black marble-like table in the center, behind which Tavera sits, her hands clasped in front of her, her eyes cast down. The light in the room is tinted violet by a colored tube in one of the fluorescent lights. It shines coolly upon several elaborate, immaculately maintained altars devoted to innumerable Catholic saints and various deities, their statues surrounded with glowing candles and generous offerings of food, tobacco and liquor. The air is heavy with the scent of camphor—a cube of resin sits on the table in a bowl of water—and fresh herbs. Behind Tavera stand three Santa Muerte statues. She speaks in Spanish—with Stephen and Rakna both translating—in melodic tones that are soothing yet firm. Tavera tells of how she grew up with her grandmother, a bruja (witch) who's now 105 years old. The Tavera family has prayed to Santa Muerte over many generations, and Tavera's grandmother conducts healing ceremonies with herbs in a northern Mexican town with 13 other women. Every seven years, the women in her grandmother's group donate braids to a resin statue of La Santisima. Hair, Tavera says, "is the connection with Mother Earth." Tavera has worked with herbs and done spiritual cleansings since she was 9. After she was married, she immigrated to Texas, and then, in 1999, to Utah, she says, where she opened Botanica San Antonio. She describes herself as a spiritualist who communicates with both the spirit world and Santa Muerte. La Santisima, she says repeatedly while motioning with her hands, is "a very powerful señora. Everything you ask, she does, and you are never afraid." Santa Muerte takes those struggling with drugs or alcohol and puts them on healthier paths of life. And as the dispenser of death, she can also choose the moment to take a life. 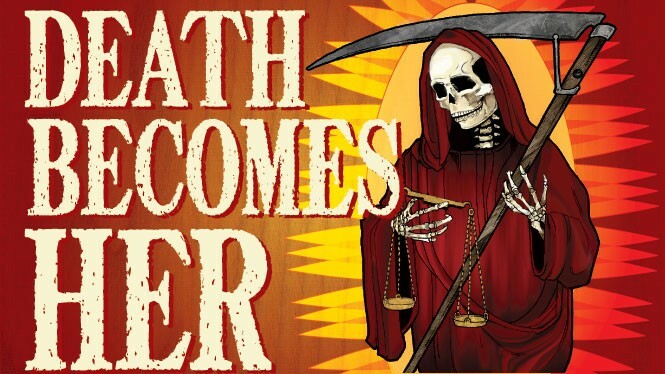 Santa Muerte, Tavera explains, is about fairness and justice, not about protecting drug dealers. She protects women against abusive husbands, and commands with her scythe errant partners to return to their spouses, and to give his or her partner the money the family needs. "Bring your money home," Tavera says Santa Muerte tells a selfish husband. "Here, it's needed." Father Eleazar Silva routinely finds Santa Muerte statues left on the steps of his church by people for whom “something went wrong” with their devotion to her and who want him to destroy them. The store sells Santa Muerte candles labeled "Contra la ley," or "Against the law." Such candles, Tavera says, are for someone who is driving without insurance, is struggling to pay their rent, and prays to Santa Muerte to hide his or her license plate from law enforcement. "They don't want a ticket because they don't have insurance, and because of their faith," she says, they don't get one. Rakna mentions that Santa Muerte communicates through dreams. That's how Kolbie was approached: in three dreams several years after that first tattoo-shop encounter. In the first dream, Kolbie visited a botanica and found that every object had Santa Muerte's image on it. In the second, Santa Muerte appeared as herself, wearing a long purple robe, clouds swirling behind her. In the third, Kolbie awoke while invoking Santa Muerte's name in a prayer. Tavera doesn't like answering questions, she says, believing that "the more secrets there are, the better." But, she says, she let us in because she saw that Kolbie is "an honest believer." Stephen asks Tavera how she knew that Kolbie is a believer. "It's in her eyes and what she carries on her back, a very beautiful protection," she replies. A Los Angeles-based santero—an initiated priest in the Lukumí, or Santeria, religion—who went by Dr. E did a tarot-card reading for Kolbie over the phone and told her that Santa Muerte wanted to develop a relationship with her, and that Santa Muerte would become a powerful ally and guardian for her. She would be a spirit that Kolbie would cut deals with to bring about desired change, he said. But if she didn't keep her end of the bargain, Santa Muerte would take payment as she saw fit. It was the first time that Kolbie had felt a spirit make contact with her, and she felt obligated to answer the call. After the interview, Tavera brings forth a bottle of tequila and pours a little into our outstretched palms, telling us to moisten our brows and the back of our necks with it, so that we will not be accompanied by negative energy or spirits when we leave the botanica.